A week last Saturday I drove to Insole Court in Cardiff in preparation for the wedding of Lynn and Rich. Unbelievably after all the amazing weather we’ve had in the UK recently, it decided to tip down on their wedding day! However, rain certainly doesn’t stop play when we have a wedding to enjoy! Lynn arrived a good half an hour early so we had to hide her away from Rich who was also already there! Insole Court is the most beautiful building where Lynn remembers visiting as a child. She recalls reading books in what was once a library there. At the rear of ths exquisite building are small stone lions which she remembers playing on as a little girl! The building is now licenced for marriages and this is where their ceremony and reception was held. The eldest of Lynn’s four adult sons Alex walked her down the aisle. Best friend Lisa was her Matron of Honour. 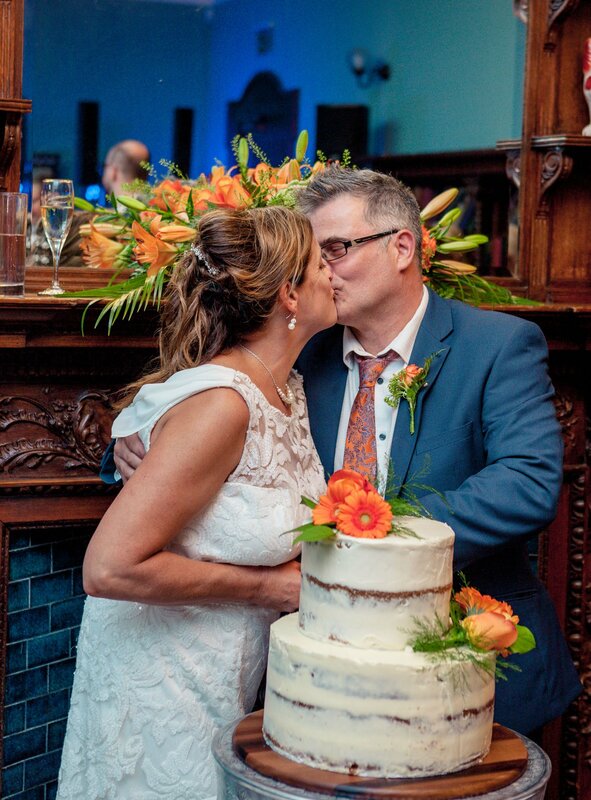 Lisa was also once a florist and arranged the beautiful orange bridal boquet and floral displays. Both Lisa and then Lynn’s youngest son gave a reading during the ceremony. Rich’s best friend Steve was his best man and dutifully handed over the rings! It was quite an emotional day in all. Rich’s mum has been in a home for some time and not at all well. They didn’t know until the day itself if she would make the wedding. However, mum was determined and arrived with her young assistant to support her throughout the day. The ceremony room was soon transformed in preparation for the serving of the wedding breakfast. After the meal, speeches were made by Rich, Lynn’s brother and Lisa. Rich’s son Morgan played a beautiful piece on his electric guitar called Obsession Confession by Slash. By the time he had finished, his very proud grandad was in tears! Honestly even whilst editing the photos, I welled up – and I was there in the first place! The rain eventually subsided late afternoon to enable us to get a few outdoor photos. 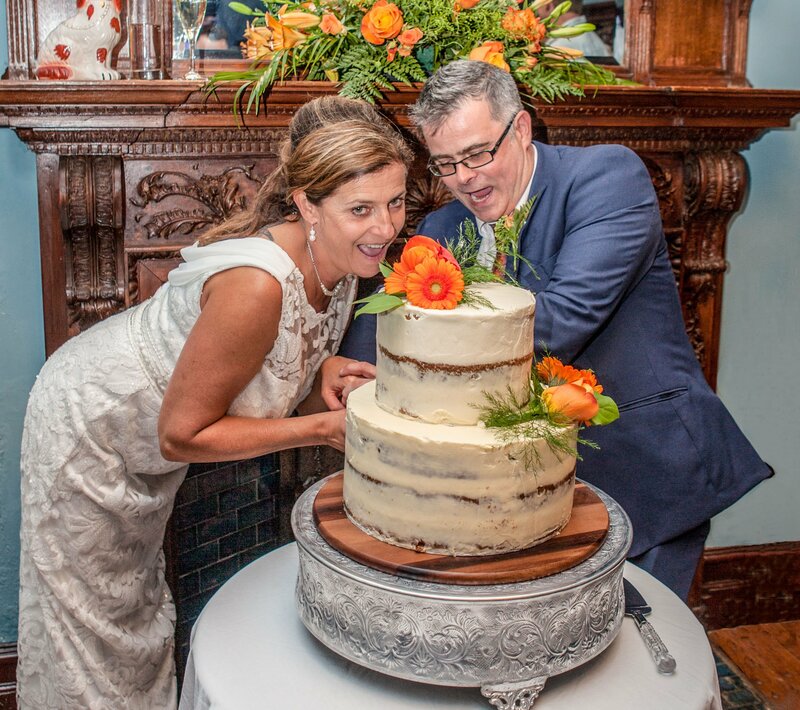 The evening guests soon started to arrive and the stunning carrot wedding cake made by the talented Mr Beesley (best man’s brother Paul) was cut up and served. One of the best wedding cakes I’ve ever tasted (and I’ve tasted a few over the years)! The evening really kicked off when the brilliant UK Blondie Tribute Act got everyone up and dancing. Ahhh Tania! These are wonderful! Though some of the expressions on my face on one or two are a bit dubious! Thank you!